hey interesting post and loved what medha wrote!! wow... the joys of aunt and motherhood :-) Nice me-me. I truly admired your Medha's B'day card for you..Out of this world!! Isn't watching a baby progress a truly miracle of nature? Nice name Misha..and nice me-me (Ashi me-Ashi me--hehee..I feel English me is derived from Marathi Me..whatsay?? 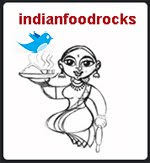 Manisha, you are well on track for the 30 or was 31 days non-stop blogging and lucky us :) we get to read everyday. How about your baseball team called the Colorado Rockies? I saw a 15 minute news segment on their win and 8 day break, thought I'd check with you. What a fun post...and that was so sweet of Medha...these little gestures are what will remain etched in your heart forever. Go Rockies!!! What an amazing winning streak! And yay for me for not missing a day since I started! I am glad you guys enjoyed this post, especially Medha's poem! Purnima, that is priceless! Ashi me, ashi me! RP, you have been bitten by the Inji bug! Of course, it is me! My blog is all about funny faces, including mine! Wonderful post. The card is lovely! In an essay, my son once wrote 'I think my mom loves me a lot because she never sends me to bed hungry.' Ofcourse he now finds it awfully embarassing. I tell him that by saving such nuggests we are not only preserving memories but also collecting ammunition for teasing-sessions for the years to come! I've been enjoying you daily posts a lot. Medha's lil' b'day card is so touching! And Misha is such a cute name :). This truly was a heartwarming post! Hugs to the two kiddos :). lovely meme. 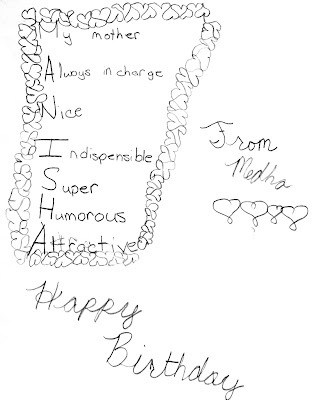 medha's card shows that she herself is very intuitive - like her mom. Aah..so this is where she used the 'indispensable' that she was asking her dad about huh? :) That's so cute. Didn't know that these were called acrostic poems though I've attempted doing this several times. That was a nice meme Manisha.